(Nanowerk News) Over billions of years, intricately structured, high-performance natural materials, such as nacre (also known as mother of pearl), have evolved. 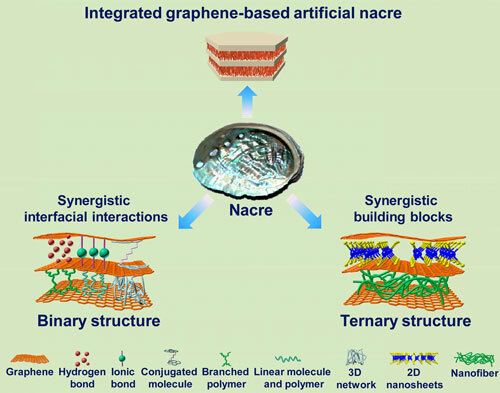 Although research on artificial nacre first started more than 20 years ago, integrated graphene-based artificial nacre is still in its early stages. Work in this area would be greatly enhanced by the synergistic effects of designing interface interactions and combining different building blocks. In new research, reported in a Perspective article ACS Nano ("Learning from Nature: Constructing Integrated Graphene-Based Artificial Nacre"), scientists from the Key Laboratory of Bio-inspired Smart Interfacial Science and Technolog in Beijing, have demonstrated an integrated graphene-based artificial nacre with isotropic mechanical and electrical properties due to graphene's intrinsic 2D structure, which is superior to nanofiber-reinforced composites. The researchers anticipate near-term breakthroughs in graphene-based artificial nacre for the development of promising applications in many fields, such as aerospace, flexible supercapacitor electrodes, artificial muscles, and tissue engineering. Integrated graphene-based artificial nacre may also be a potential platformfor the design and construction of robust intelligent devices, such as actuators, artificial muscles, and sensors.